If you think only hipsters wear fake glasses, just give it time. When smartglasses are everywhere, we'll all be doing it. Tech companies are pinning their hopes on the belief that people – those who need no visual prescriptions – will put on a pair of augmented reality smartglasses. Could this change glasses-wearing behaviour as a whole? It's probably already begun. Snap recently announced Spectacles 2, its second-gen glasses that now let you take photo and videos underwater too. Though they don't do a lot more than last year's version, they're furtively normalising the idea of putting tech on our faces. Non-prescription glasses have become a popular fashion trend that will likely spur adoption of smartglasses. 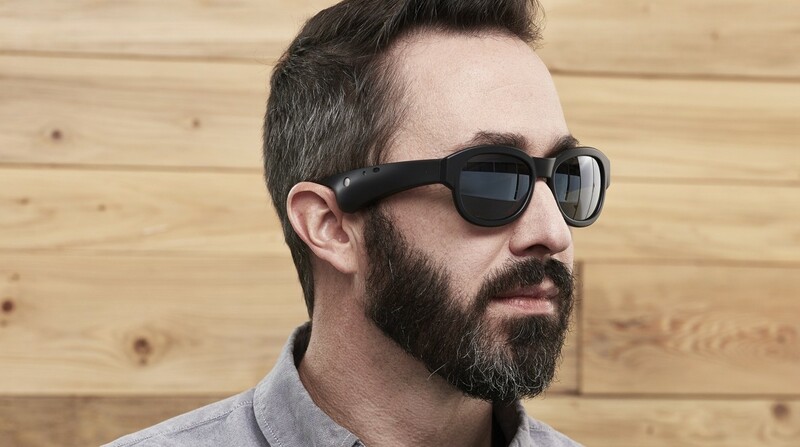 This is being reflected in early interest in these products, says Aaron Rowley, creator of the Vue smartglasses that use audio rather than visuals to convey information. "We had a significant number of pre-orders for clear, plano lenses," he says. "It wasn't a bestseller, but we were surprised by the high percentage of pre-orders and its certainly enough to justify carrying it long-term as a lens type." With the dark days of Google Glass behind us, the prospects for smartglasses seem more optimistic, with companies like Epson, Solos and Everysight already making smart headwear. Andy Karp, the editor of Jobson Optical Group, has written extensively about smartglasses and fully believes in the potential of these devices to not only complement our lives, but become integral. "A small but growing number of consumers are beginning to experiment with wearing smartglasses, but at this point, they're wearing them primarily for function, not fashion," says Karp. "Most smartglasses don't look very fashionable because the form factor hasn't evolved yet." That said, stylish smartglasses are starting to surface, like VSP Global's Level smartglasses. "They have an activity tracker, but don't have bulky features such as an on-board camera, so the designers had more leeway in styling the frame," says Karp. He sees smartglasses being worn both by people who require vision correction to function – and those who don't. "When prescription eyewear folks start wearing smartglasses, we'll see changes in their behaviour as smartglasses begin to replace other devices such as smartphones." Take the Epson Moverio line of smartglasses, which can be worn with or without prescription lenses. "Our primary sales are to drone pilots, remote enterprise workers and museum or theatre-based visitor experiences," says Eric Mizufuka, the product manager of augmented reality at Epson USA. "The major theme is that other people know you're wearing smartglasses, and more importantly, they know why you're wearing them." But on a consumer level the market is still niche. "Today, non-prescription smartglasses are changing glasses-wearing in niche markets, where the utility of the glasses exceeds their cost and appearance," says Mizufuka. "Ultimately, there will need to be drastic improvements in product size, functionality, price and form factor before smartglasses become mainstream – let alone a fashion statement." It isn't a fashion statement yet, in other words. "Today, smartglasses with embedded displays are used solely for utility, not fashion, it's more of 'what do the glasses enable me to do' versus 'how do they make me look?'" Everysight makes smartglasses for the sports market, specifically for cyclists, displaying information like the direction the wearer is riding in, the speed and the athlete's heart rate. According to the team, roughly 80% of their users use non-prescription smartglasses. "Smartglasses hide technology in the form factor of regular glasses, which are very much a fashion accessory," says Ilay Avni, the head of digital at Everysight. "We put a lot of effort into creating a nice looking pair of glasses that will integrate seamlessly with the cyclist's helmet and will still be able to carry the computing power and all the technology we have inside." To Avni, the future will see more of this seamless approach. "I predict more glasses companies will become technological companies, and we will see full collections of smartglasses in different designs," he says. "We are at the beginning of a new era, in that regard." The key is all in the design, according to Leslie Muller, co-director VSP Global's innovation lab, The Shop. "Eyewear is the oldest form of wearable technology in the world," says Muller. "Eyewear is a medical device and a fashion accessory, so respecting the importance of seamless design is critical to ensuring adoption of wearable technology." But coming up from behind, slowly but surely, are smart contact lenses that could one day make smartglasses redundant. Stephen Willey, founder of smart contact lens company Innovega Inc., believes he's made a smarter bet on the future. "We make an optics element that enables designers to deliver stylish, high performance smartglasses," he say. "In our surveys, more important than the need for vision correction was age, demographic, interest in gaming and social media, which is why AR is the opportunity of a generation. It's the onset of fundamental new ways to access, investigate, manipulate and enjoy media." Until that day comes, how convinced are we that people who don't need glasses will wear them? While it's still early to tell, the use of non-prescription smartglasses could change. "Wearing non-prescription smartglasses is elective and the decision to wear them is largely dictated by lifestyle choices or work requirements," says Andy Karp of Jobson Optical Group. "When eyeglasses become multi-functional, they will become an even more essential part of our lives."